In 1905, in a paper titled "Does the Inertia of a Body Depend Upon Its Energy Content," Albert Einstein proposed the revolutionary concept that an object's mass is a measure of how much energy that object contains, opening a door to a host of world-changing developments, eventually leading us to the major understanding that the source of all energy in the universe is, ultimately, the conversion of mass into energy! If mass is a measure of an object's energy, we need to re-evaluate our statements of the law of conservation of mass and the law of conservation of energy. Up to this point, we have thought of these as separate statements of fact in the universe. Based on Einstein's discovery, however, mass and energy are two concepts effectively describing the same thing, therefore we could more appropriately combine these two laws into a single law, the law of conservation of mass-energy, which states that mass-energy cannot be created nor destroyed. The concept of mass-energy is one that is often misunderstood and oftentimes argued in terms of semantics... for example, a popular argument states that the concept of mass-energy equivalence means that mass can be converted to energy, and energy can be converted to mass. Many would disagree that this can occur, countering that since mass and energy are effectively the same thing, you can't convert one to the other. For our purposes, we'll save these arguments for future courses of study, and instead focus on a basic conceptual understanding. This is a very large amount of energy... to put it in perspective, the energy equivalent of a large pickup truck is in the same order of magnitude of the total annual energy consumption of the United States! More practically, however, it is not realistic to convert large quantities of mass completely into energy. Current practice revolves around converting small amounts of mass into energy in nuclear processes. Typically these masses are so small that measuring in units of kilograms isn't practical. Instead, scientists often work with the much smaller universal mass unit (u), which is equal in mass to one-twelfth the mass of a single atom of Carbon-12. The mass of a proton and neutron, therefore, is close to 1u, and the mass of an electron is close to 5*10-4 u. In precise terms, 1u=1.66053886*10-27 kg. One universal mass unit (1u) completely converted to energy is equivalent to 931 MeV. Because mass and energy are different forms of the same thing, this could even be considered a unit conversion problem. If given a mass in universal mass units, you can use this equivalence directly to solve for the equivalent amount of energy, without having to convert into standard units and utilize the E=mc2 equation. The nucleus of an atom consists of positively charged protons and neutral neutrons. Collectively, these nuclear particles are known as nucleons. Protons repel each other electrically, so why doesn't the nucleus fly apart? There is another force which holds nucleons together, known as the strong nuclear force. This extremely strong force overcomes the electrical repulsion of the protons, but it is only effective over very small distances. If measured carefully, we find that the mass of a stable nucleus is actually slightly less than the mass of its indivudal component nucleons. The difference in mass between the entire nucleus and the sum of its component parts is known as the mass defect (Δm). The binding energy of the nucleus, therefore, must be the energy equivalent of the mass defect due to the law of conservation of mass-energy: Ebinding=mc2. 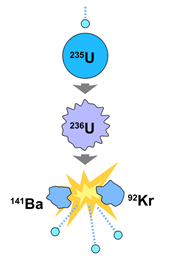 Question: After a uranium nucleus emits an alpha particle, the total mass of the new nucleus and the alpha particle is less than the mass of the original uranium nucleus. Explain what happens to the missing mass. Answer: The missing mass is converted into energy.